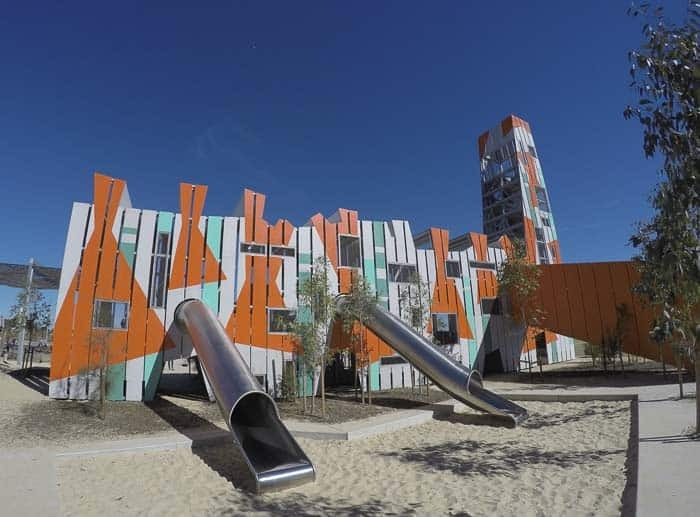 Sydney’s hottest new playground is definitely Bungarribee Park Playground near Blacktown. Family travel blogger Leah Smileski of the excellent Kid Bucket List has explored it with her two kids. Mine are very jealous as we haven’t been yet. Here’s what Leah has to say. 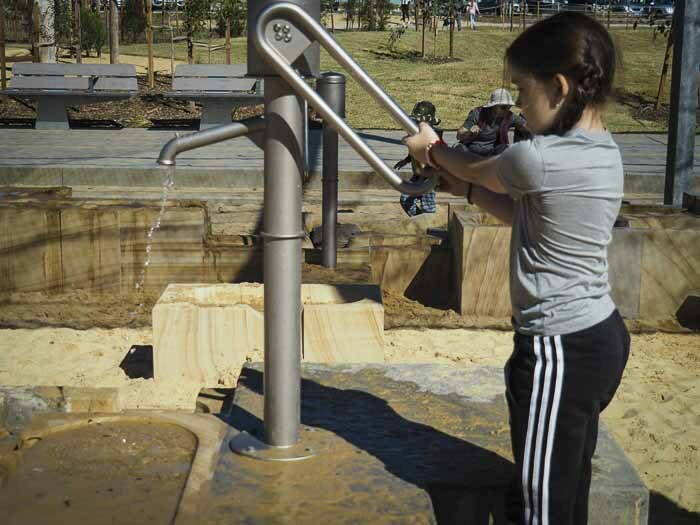 In March 2017, the city of Blacktown officially opened Bungarribee Park, a new family space as an addition to their enormous 5,380 hectare Western Sydney Parklands. Touted as the largest park in Western Sydney we had to check it out for ourselves. 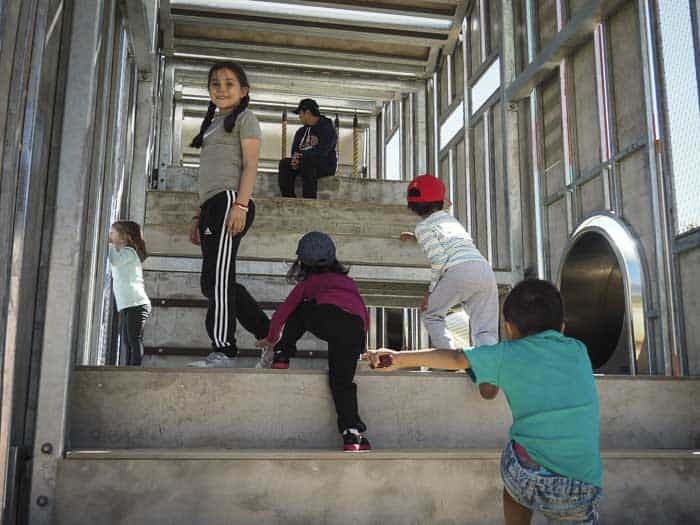 As more and more people become aware that Bungarribee Park is now open, the space is becoming much more popular on the weekend. If you would like to visit, arriving before mid morning well help secure you a spot in the car park closest to the playground. This little tip helped us find one as soon as we arrived. 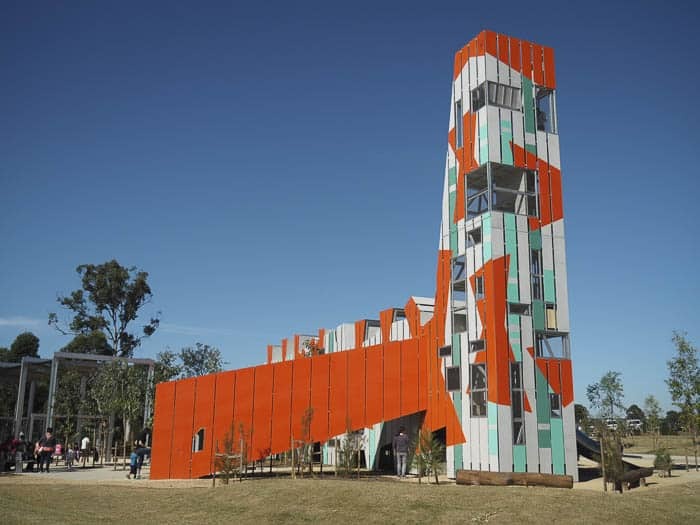 The playground is quite striking with the central feature an enormous 14 m high climbing tower, suitable for all ages, but appealing for any tweens you have in your group when you visit. My two made a beeline for this as soon as they were out of the car and spent a good half an hour using it to base a game of tag. They loved racing up to the top and then sliding down as fast as they could, squealing all the way. You are going to find it hard pressed not to find something that your kids won’t like at this playground, regardless of their age. It includes a fantastic water play area which, from my observation, was a favourite for the toddlers and preschoolers on the day we visited. It also has seesaws, 50m long flying foxes, balance beams, swings, a spinning chair and spinning dish style ride. But… the playground isn’t perfect because…. whilst my kids absolutely delighted in playing in this park, one of my major gripes is that despite four years of community consultation, the playground has not adhered to universal design principles. Thus the tower and even the water play area are largely inaccessible for those with mobility issues. The tower has no ramp even to the smallest of slides, and the swings and flying fox have no harnesses for those that may need them. Come on Blacktown Council – can you do something about this? 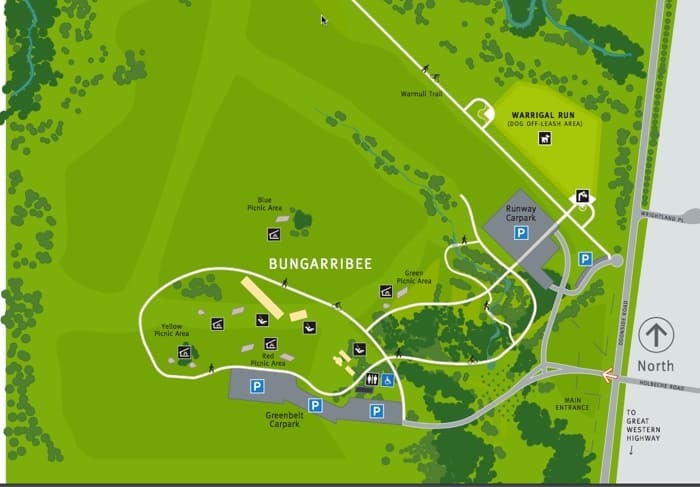 Directions: Entry to Bungarribee Park is at the intersection of Holbeche and Doonside Roads in Bungarribee. Toilets/Baby change: Yes, the toilet block is right next to the car park and has baby change facilities. When we visited they were clean, with plenty of soap in the dispensers and paper on the rolls. Shade: There are now shade cloths – hooray! Nearby takeaway coffee: Not on site. Bring your own picnic or barbecue. Extra: There are ample water bubblers spread around the park where you can fill up your bottles. As the park is also dog friendly (it has a doggie park incorporated into the space just as you enter from the main road), each bubbler also has a small bowl at the bottom for dogs too. Barbecue and Picnic Facilities: There are 20 barbecues and 13 picnic shelters scattered around the park. Every single one was already occupied when we arrived at 10.00 am so you will need to arrive super early to grab one I think. At this time there is no booking facility so whoever gets their first can claim the space. Walking and cycling: We decided to explore the grounds beyond the playground on our visit and discovered that the park also has a great cycle / walking sealed walking track. It is even and suitable for scooters as well as bikes. Dog Park: If you want to bring your dog you’ll find them welcomed around the park if they are on their leash. However, if you walk a short distance from the playground to the Warrigal Run you will find an enclosed off-leash space to give your pup a run. It’s also home to the annual Woof-Fest which runs each June. 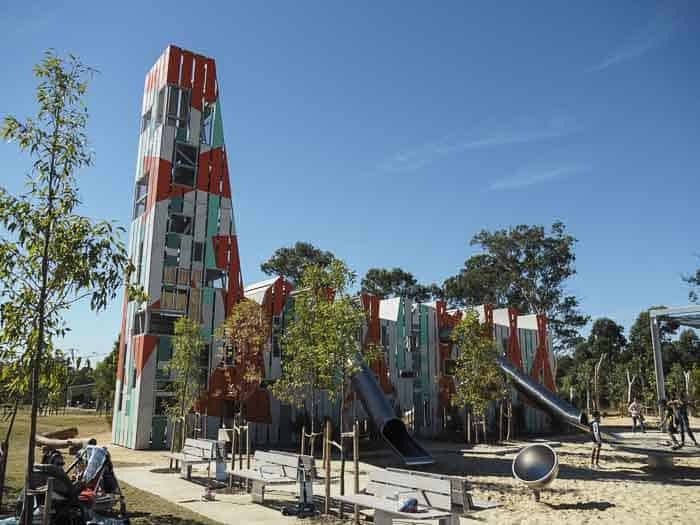 Bungarribee Park is Western Sydney’s largest park and the perfect spot to give the kids some space to run off some energy. 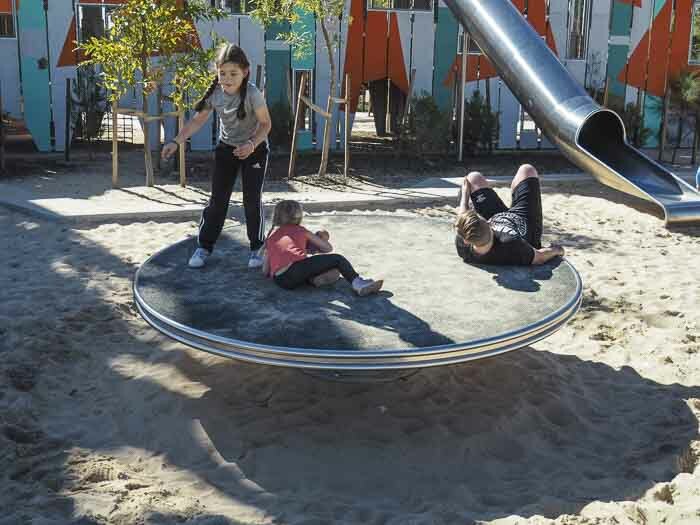 The playground is suitable for all ages and you can even bring your dog. Will you be heading their soon? Thank you so much Leah, do pop over to visit Leah’s excellent family travel blog Kid Bucket List. You can also find here on Facebook and Twitter. Great review thanks. Would love Blacktown Coucil to plan more inclusively.